I'm still basking in the afterglow of Monday night's win at Old Trafford. But, I digress. Our attention must turn back to the league again, where Arsenal sit in sole possession of third place with ten matches to play. They are, however, only one point clear of Manchester United (with another visit to Old Trafford slated for mid-May,) three points clear of Liverpool (who visit the Emirates in three weeks,) four points clear of Spurs, and five points clear of Southampton. Thanks to a quirk in the fixtures list, only four of Arsenal's remaining ten league games are on the road and three of those four are against clubs in the bottom half of the league table. Still, with so many points still on the table, it's paramount for Arsenal to continue winning games. Let's stay in the top three, three points at a time. This is an artist's depiction of the first sign of Diaby's return. The only negative fallout from Monday's win is the loss of Alex Oxlade-Chamberlain who, according to your crazy uncle, the Daily Mail, could be out for four weeks with a hamstring injury. The club later confirmed that length well after I wrote this paragraph, but I didn't want to remove the crazy uncle joke, so now I'm writing this explanatory sentence. Anyway, this means that Arsene Wenger will have to find new and more interesting ways to not play Theo Walcott on the right wing. In the center of midfield, Jack Wilshere remains out after his "little surgery," though Mathieu Flamini is available again. In surprisingly good news, Gabriel Paulista is back in training on Sunday, which is much faster than I expected. It's still a month for Mathieu Debuchy and Mikel Arteta, while Abou Diaby will remain out until the Sun enters its red giant phase. 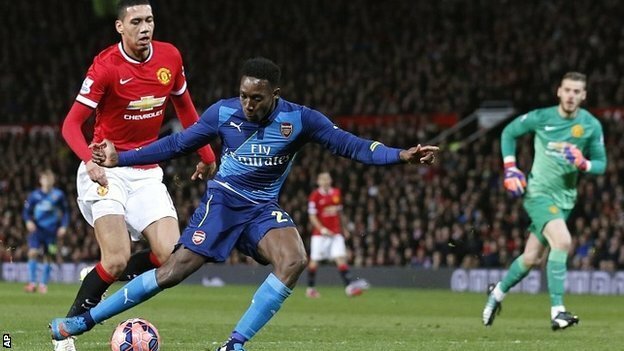 Tomas Rosicky missed the match at Old Trafford through illness, which puts him in the "doubts" category for now. There are some selection questions at the back. Has Wojciech Szczesny won his job back between the sticks? How about Nacho Monreal vs. Kieran Gibbs at left back? For my predicted XI, I've merely maintained the status quo from the last league match. Predicted XI: Ospina, Bellerin, Koscielny, Mertesacker, Gibbs, Coquelin, Cazorla, Ozil, Sanchez, Welbeck, Giroud. Enner Valencia is in line for strangest injury of the season; the Ecuadorian international cut his big toe on a broken teacup in his home and required emergency surgery to repair the freak accident. West Ham do not need to be further depleted on their front lines, of course, as Andy Carroll's season is over after a knee injury. Carlton Cole is almost certainly out with a hamstring injury, while center back Winston Reid is a major doubt with a hamstring injury of his own; Reid was removed on eight minutes from West Ham's last match against Chelsea last midweek. Elsewhere on the back line, Carl Jenkinson is ineligible to play against his parent club due to the terms of his loan deal. Without Valencia, Cole, or Carroll, West Ham would only have Diafra Sakho available as a striker, meaning they could have to play a 4-5-1 instead of a 4-4-2. In some good news, West Ham will have Morgan Amalfitano back from suspension. Predicted XI: Adrian, Demel, Tomkins, Collins, Cresswell, Song, Noble, Kouyate, Amalfitano, Downing, Sakho. For as "up and down" as we've talked about Arsenal's form being not only all season but in the last few weeks as well, it's refreshing to say that Arsenal's form right now is "we won at Old Trafford, ahhhhhhhhhhh!" In addition, Arsenal enter this match having won four straight in the league for the first time all season. Since the loss at Southampton on New Year's Day, Arsenal have won 11 and lost two. As for West Ham, well, after they beat Swansea on December 7, they were third in the table; Manchester United pipped them for third the next day, but still. Since that win, West Ham have a record, across all competitions, of three wins, eight draws, and six losses. In league play, they have won one of their last 11. They are now sitting in 10th, 15 points behind third place Arsenal. Currently winless in seven across all competitions, West Ham have scored just four goals in those seven matches. In addition, West Ham have not won on the road this season against a club higher than them in the table. Arsenal have now won nine straight against West Ham across all competitions, after they won 2-1 in late December at Upton Park in the reverse fixture. Ex-Arsenal midfielder Alex Song seemed to have an early opening goal, but it was ruled offside. Arsenal struck twice before halftime to take a 2-0 lead through a Santi Cazorla penalty and a Danny Welbeck goal, but Cheikhou Kouyate's 51st minute goal set up a grandstand finish. When Arsenal won this fixture last year, in the days following their FA Cup Semi-Final win over Wigan, it marked the fourth consecutive time Arsenal conceded the opener, then went on to beat the Hammers. Matt Jarvis scored the opener for the visitors in the 40th minute, but Lukas Podolski netted a critical equalizer before halftime. Olivier Giroud gave Arsenal a 2-1 lead in the 55th and Podolski's second of the night secured all three points in the 78th. 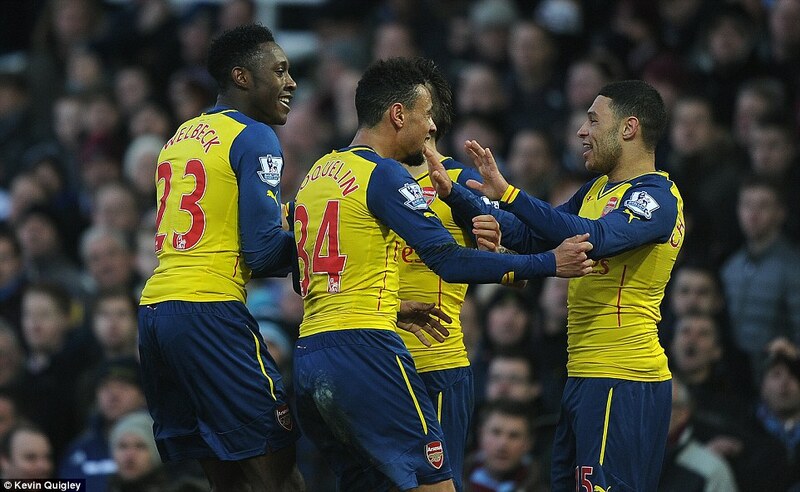 The Gunners are also unbeaten in 14 against the Hammers. West Ham's last win against Arsenal marked the first time a visiting team won at the Emirates Stadium; Bobby Zamora scored just before halftime and West Ham held on to win 1-0 in April of 2007.
remembers he forgot to return that Redbox DVD. 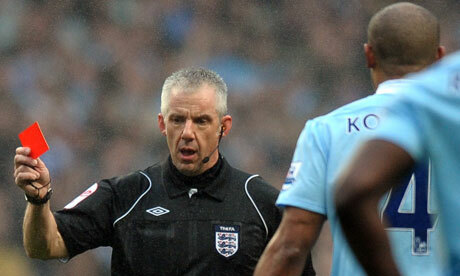 The referee is Merseyside-based Chris Foy. This is Foy's first match since February 21, as he is just returning from injury. This will be the second time Arsenal have seen Foy this season; he previously took charge of the Gunners' 1-0 win at West Brom at the end of November. John Painting is a contributing writer to the Modern Gooner and hopes you don't underestimate the impact Darmo, Devourer of Souls had on Monday's win at Old Trafford. You can follow him on Twitter @zorrocat. Hail Darmo, again.